Hi! The years is ending soon and this is the Lawnscaping Challenge for this year. But stay tuned for the blog hop and more challenges next year. And here's a secret, we have new sponsors for the challenge so get your lawn fawn stamps prepare for next year! Today's theme is Merry Christmas so I thought I'd just keep it straight forward and have some fun with distress inks. I'm using a mirror technique for this card, you can find the tutorial I did for lawnscaping with this link. Hope you've enjoyed my card and give this technique a try. 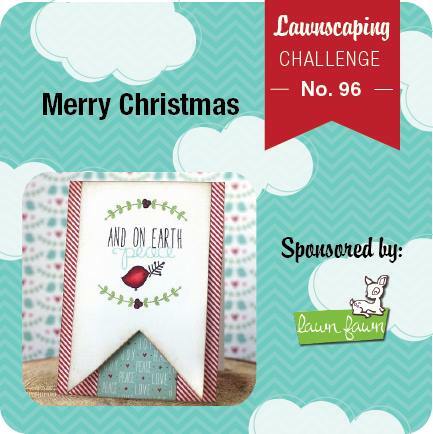 Head over to Lawnscaping Challenge to enter your own Christmas card to win a prize sponsored by Lawn Fawn! so cute, love those guys. This is SO adorable!! Love that sky an those little penguins skating towards each other!!! So so so so sweet!! Your card is too cute Marina!! !